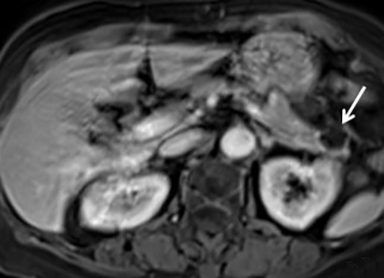 Numerous solid and cystic pancreatic masses are encountered on cross-sectional imaging. Solid masses include pancreatic adenocarcinoma, neuroendocrine tumors, and metastases. Some masses, such as pancreatic adenocarcinoma and neuroendocrine tumors, are typically solid but uncommonly may be cystic. Cystic pancreatic masses include pseudocyst, serous cystadenoma, mucinous cystadenoma, intraductal papillary mucinous neoplasm, and solid pseudopapillary tumor. 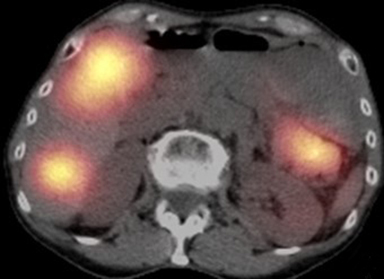 Diagnosis may be aided by a multimodality approach including multidetector CT, MRI, endoscopic ultrasound, single photon emission computed tomography (SPECT), and positron emission tomography (PET/CT). 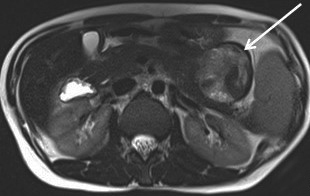 When a pancreatic mass is suspected, dual-phase (arterial and venous) contrast-enhanced CT or multiphase enhanced MRI is performed. Adenocarcinoma is typically most conspicuous on arterial phase images where it usually appears hypoattenuating relative to the enhancing pancreatic parenchyma. The arterial phase images are also used to assess for encasement of peripancreatic arteries (defined as tumor contact involving more than 180 degrees of vessel circumference). Venous phase images are optimal to evaluate for liver metastases and encasement or thrombosis of peripancreatic veins. 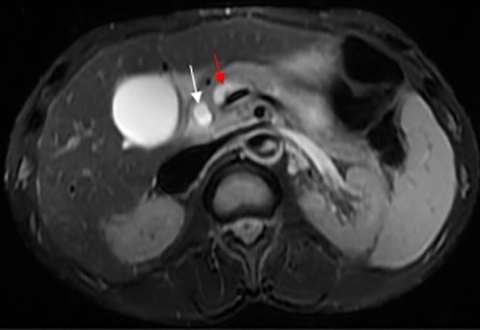 Tumor in the pancreatic head may cause dilation of both the common bile duct and main pancreatic duct, creating a “double duct sign” (Figure 1). 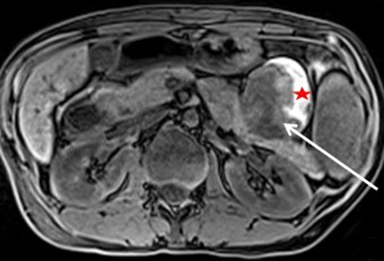 Approximately 5-11% of tumors may be isoattenuating to the pancreas on CT, in which case indirect findings may be helpful such as mass effect or abnormal convex contour of the pancreas, interruption of the pancreatic duct, dilation of the common bile and pancreatic duct, and atrophic distal pancreatic parenchyma.2 In addition, approximately 8% of pancreatic adenocarcinomas have cystic features.3 On MRI, adenocarcinoma is typically described as demonstrating low signal intensity on T1- and T2-weighted images due to its fibrotic nature. However, the lesion can atypically be heterogenous or mildly hyperintense on T2-weighted imaging (Figure 1). 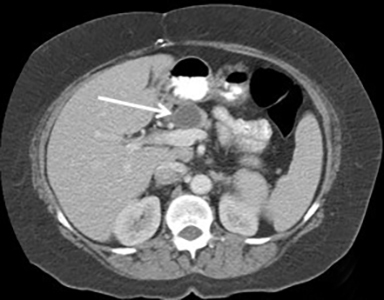 The imaging appearance of pancreatic NETs is variable. 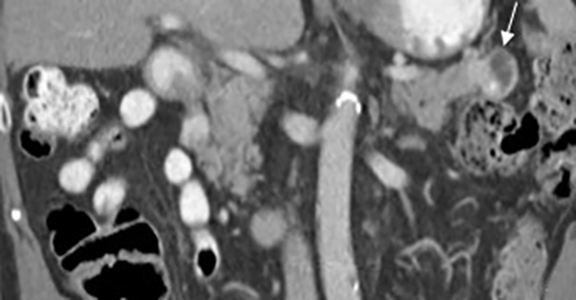 Smaller tumors tend to homogeneously enhance on arterial phase images and may be hyper-, iso-, or hypoenhancing relative to the pancreatic parenchyma on venous phase images. 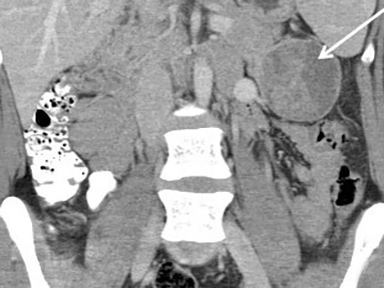 Larger lesions may demonstrate cystic degeneration and calcification, with calcification seen in 20% of NETs.1 Cystic NETs tend to have a peripheral hypervascular rim (Figure 2).7 Pancreatic ductal obstruction is uncommon. On MRI, most NET’s have low signal intensity on T1-weighted images and intermediate to high signal intensity on T2-weighted images.1 111 In-radiolabeled octreotide has high sensitivity for detecting NETs with the exception of insulinomas and poorly differentiated NETs. Pancreatic metastases account for approximately 2-5% of all pancreatic malignancies. 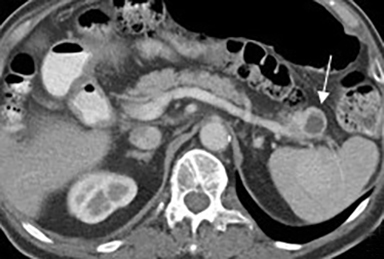 Renal cell carcinoma and lung carcinoma are the most common primary tumors that metastasize to the pancreas, followed by breast and colorectal carcinomas and melanoma.1 Metastases are more commonly solitary rather than multiple and have imaging features related to that of the primary tumor (Figure 3). Serous cystadenomas are benign cystic neoplasms that comprise approximately 20% of pancreatic cystic lesions.8 Because approximately 75% occur in females with a mean age of 61, they are sometimes referred to as the “grandmother” lesion.9 Patients with von Hippel-Lindau disease may have multiple serous cystadenomas. 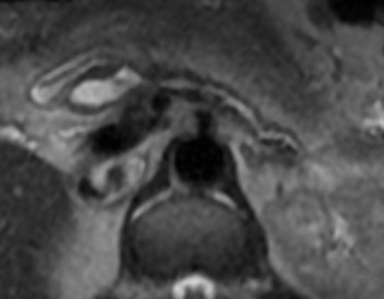 However, this lesion can atypically occur in elderly males (Figure 4). Serous cystadenomas typically have a microcystic appearance, consisting of multiple (>6) cystic locules, each less than 2 cm, lined by glycogen-rich epithelial cells and separated by fibrous septa. 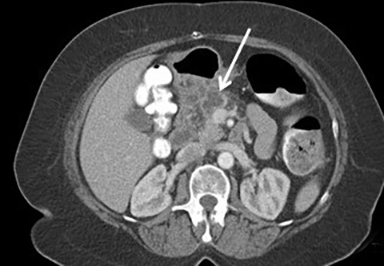 On CT, serous cystadenomas usually have a lobular border, do not typically cause pancreatic or biliary ductal dilation, and displace rather than invade adjacent structures.10 A calcified central scar is highly characteristic but only present in approximately 30% of patients (Figure 4).11 The presence of large numbers of microcysts may produce a solid appearance on CT.10 On MRI, the lesion appears as a cluster of small cysts, usually demonstrating simple fluid signal intensity, though occasionally showing T1-hyperintensity if there is hemorrhage. There is enhancement of the thin fibrous septa separating the cystic locules and the central scar. Calcification of the central scar may result in a signal void. There is no communication with the pancreatic duct. 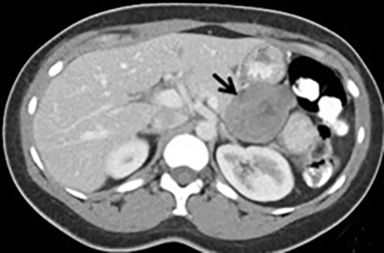 Revised Atlanta Classification of pancreatic fluid classifications has been recently published and defines a pancreatic pseudocyst as a fluid collection persisting greater than four weeks after a diagnosis of interstitial edematous pancreatitis. 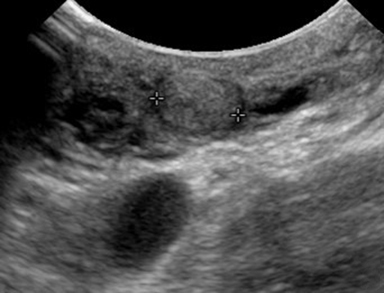 A fluid collection persisting greater than four weeks after necrotizing pancreatitis is recognized as walled off necrosis in the revised classification. 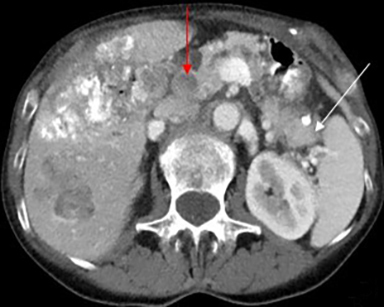 Mimics: Multiple lesions can mimic primary pancreatic masses, such as duodenal diverticula, accessory splenules in the pancreatic tail, retroperitoneal masses, or masses arising exophytically from adjacent organs (Figure 9). 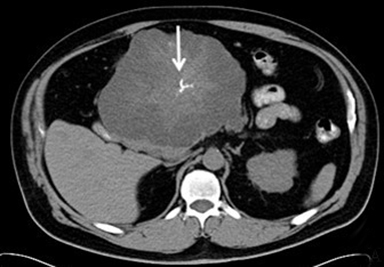 Multiple solid and cystic pancreatic lesions are encountered on cross-sectional imaging. Knowledge of the typical imaging features, relevant clinical history, and patient populations affected is imperative to formulate an accurate diagnosis. 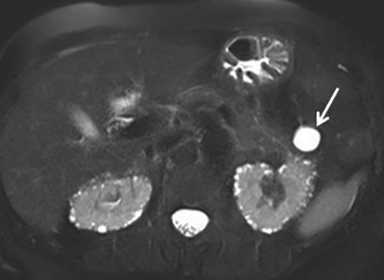 Familiarity with CT and MRI appearance of pancreatic lesions is essential as entities listed in the differential diagnoses can change the clinical approach and prognosis. A multimodality approach is frequently needed to narrow the differential diagnosis, though tissue sampling is usually required for a definitive diagnosis. Acknowledgement: The authors would like to acknowledge their use of MONTAGE, a radiology data mining and analytics software (Montage Healthcare Solutions Inc, Philadelphia, PA), to acquire some cases used in this publication. Ros PR, Mortelé KJ. 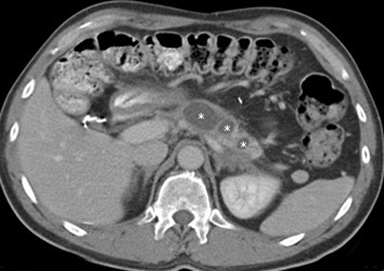 Imaging features of pancreatic neoplasms. JBR-BTR. 2001;84(6):239–249. Kim JH, Park SH, Yu ES, et al. 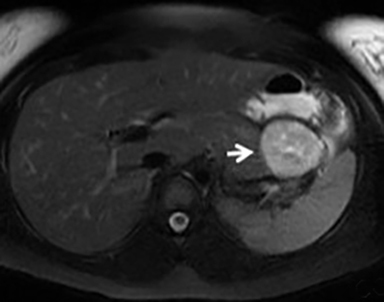 Visually isoattenuating pancreatic adenocarcinoma at dynamic-enhanced CT: frequency, clinical and pathologic characteristics, and diagnosis at imaging examinations. Radiology. 2010;257(1):87-96. doi: 10.1148/radiol.10100015. Epub 2010 Aug 9. Kosmahl M, Pauser U, Anlauf M, et al. Pancreatic ductal adenocarcinomas with cystic features: neither rare nor uniform. Mod Pathol. 2005;18(9):1157-1164. National Comprehensive Cancer Network http://www.nccn.org/professionals/physician_gls/pdf/pancreatic.pdf. Accessed February 3, 2016. Al-Hawary MM, Francis IR, Chari ST, et al. Pancreatic ductal adenocarcinoma radiology reporting template: consensus statement of the society of abdominal radiology and the American pancreatic association. Gastroenterology. 2014; 146(1):291-304.e1. doi: 10.1053/j.gastro.2013.11.004. Lewis RB, Lattin GE Jr, Paal E. Pancreatic endocrine tumors: radiologic-clinicopathologic correlation. Radiographics. 2010;30(6):1445-1464. doi: 10.1148/rg.306105523. Review. Ligneau B, Lombard-Bohas C, Partensky C, et al. 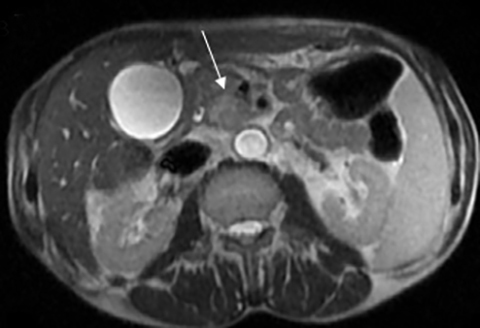 Cystic endocrine tumors of the pancreas: clinical, radiologic, and histopathologic features in 13 cases. Am J Surg Pathol. 2001;25(6):752-760. Ansari NA, Ramalho M, Semelka RC, et al. 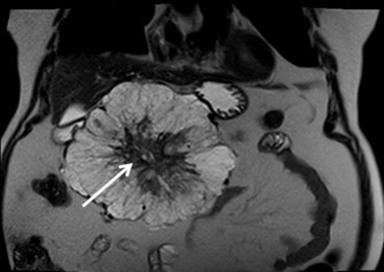 Role of magnetic resonance imaging in the detection and characterization of solid pancreatic nodules: An update. World J Radiol. 2015;28;7(11):361-374. doi: 10.4329/wjr.v7.i11.361. Review. Adsay NV. Cystic neoplasia of the pancreas: pathology and biology. J Gastrointest Surg. 2008;12(3):401-404. Epub 2007 Oct 24. Review. Khan A, Khosa F, Eisenberg RL. Cystic lesions of the pancreas. AJR Am J Roentgenol. 2011;196(6): W668-77. doi: 10.2214/AJR.10.4378. Review. Sarr MG, Kendrick ML, Nagorney DM, et al. Cystic neoplasms of the pancreas: benign to malignant epithelial neoplasms. Surg Clin North Am. 2001;81(3):497-509. Review. Chatelain D, Hammel P, O’Toole D, et al. Macrocystic form of serous pancreatic cystadenoma. Am J Gastroenterol. 2002;97(10):2566-2571. Khashab MA, Shin EJ, Amateau S, et al. Tumor size and location correlate with behavior of pancreatic serous cystic neoplasms. Am J Gastroenterol. 2011;106(8):1521-6. doi: 10.1038/ajg.2011.117. Epub 2011 Apr 5. Sahani DV, Kambadakone A, Macari M, et al. Diagnosis and management of cystic pancreatic lesions. AJR Am J Roentgenol. 2013;200(2):343-354. doi: 10.2214/AJR.12.8862. Review. Reddy RP, Smyrk TC, Zapiach M, et al. Pancreatic mucinous cystic neoplasm defined by ovarian stroma: demographics, clinical features, and prevalence of cancer. Clin Gastroenterol Hepatol. 2004;2(11):1026-1031. Sarr MG, Carpenter HA, Prabhakar LP, et al. Clinical and pathologic correlation of 84 mucinous cystic neoplasms of the pancreas: can one reliably differentiate benign from malignant (or premalignant) neoplasms? Ann Surg. 2000;231(2):205-212. Crippa S, Salvia R, Warshaw AL, et al. Mucinous cystic neoplasm of the pancreas is not an aggressive entity: lessons from 163 resected patients. Ann Surg. 2008;247(4):571-579. doi: 10.1097/SLA.0b013e31811f4449. Le Borgne J, de Calan L, Partensky C. Cystadenomas and cystadenocarcinomas of the pancreas: a multiinstitutional retrospective study of 398 cases. French Surgical Association. Ann Surg. 1999;230(2):152-161. Tanaka M, Fernández-del Castillo C, Adsay V, et al. International Association of Pancreatology. International consensus guidelines 2012 for the management of IPMN and MCN of the pancreas. Pancreatology. 2012;12(3):183-197. doi: 10.1016/j.pan.2012.04.004. Epub 2012 Apr 16. Castellano-Megías VM, Andrés CI, López-Alonso G, et al. Pathological features and diagnosis of intraductal papillary mucinous neoplasm of the pancreas. World J Gastrointest Oncol. 2014;6(9):311-324. doi: 10.4251/wjgo.v6.i9.311. Review. Kucera JN, Kucera S, Perrin SD, et al. 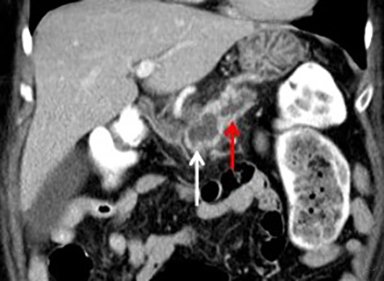 Cystic lesions of the pancreas: radiologic-endosonographic correlation. Radiographics. 2012 Nov-Dec;32(7): E283-301. doi: 10.1148/rg.327125019. Choi JY, Kim MJ, Kim JH, et al. Solid pseudopapillary tumor of the pancreas: typical and atypical manifestations. AJR Am J Roentgenol. 2006;187(2): W178-86. Low G, Panu A, Millo N, et al. Multimodality imaging of neoplastic and nonneoplastic solid lesions of the pancreas. Radiographics. 2011;31(4):993-1015. doi: 10.1148/rg.314105731. Mehta S, Dorff J. 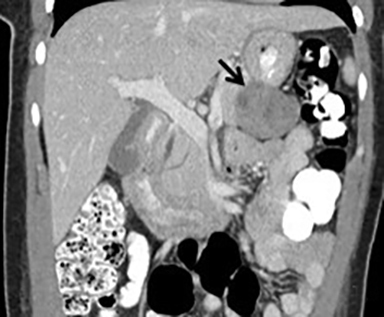 A multimodality review of solid and cystic pancreatic masses. Appl Radiol. 2018;47(8):11-17. Dr. Mehta and Dr. Dorff are Radiologists at the Hospital of the University of Pennsylvania, Philadelpha, PA. The authors have no grants, disclosures, or other assistance to declare.